A multimeter is a handheld device that combines different electronic testing and measurement tools. 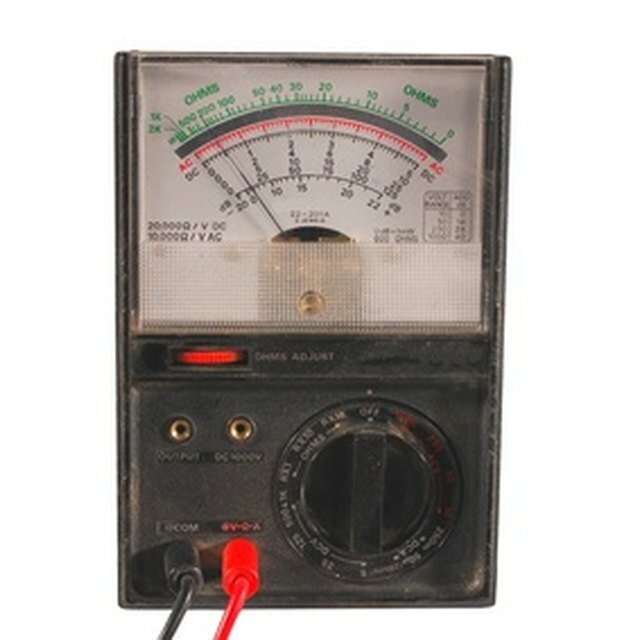 A basic multimeter measures resistance, voltage and current. More advanced models can measure capacitance, inductance, and temperature. They may also be able to measure frequency and duty cycle (a measurement relating to pulse systems such as fiber optic networks). Basic multimeters typically have a monochrome LCD digital screen capable of displaying numerical figures to two or three decimal places, plus icons to indicate the setting (an omega for resistance, for example). Older analogue models may have dial displays with a needle indicating the reading. Sophisticated modern models may feature larger screens that allow them to include an oscilloscope function, displaying waveforms graphically as well as numerical data. A multimeter has controls to allow you to select the quality to be measured, such as resistance, current or voltage. Typically the main control will be a dial which you twist to select what you're testing. Buttons or switches are also possible either as primary or as secondary controls -- for selecting the range of values you're looking at, for example (although many multimeters find the range automatically). Inside the multimeter there are different circuits for various measurements; the controls allow you to select which circuit is in use. Basic probes are insulated metal "needles" that can be touched to wires, components or tracks on a printed circuit board. They are typically color-coded:red for positive, black for negative. Electrical probes usually have a long section of exposed metal which allows for bare wire or component leads to be secured by twisting; or for alligator clips. This enables you to have your hands free while taking readings. Specialist probes are also available for testing non-electronic values such as temperature, light or pH. The power source for a hand-held mutimeter is typically a battery. Mini units may only require a single one and a half volt AA cell, while larger models with more functions may need a nine volt battery. Analog multimeters are often cheaper than digital ones but are less accurate. When reading the dial display of an analog meter it's possible to misread the position of the needle. The needle must also be set in the zero position manually, which can result in errors. It is necessary to deduce and set the range for every measurement, potentially resulting in errors of scale. Digital multimeters often avert this with an automatic range finder. Edwards, Clare. "Multimeter Parts & Functions." Sciencing, https://sciencing.com/multimeter-parts-functions-8736219.html. 13 March 2018.